Good new for all the Samsung users who like to tinker with their Galaxy devices. If you have rooted or installed a custom ROM and want to revert back the changes using a clean firmware flash and restore it to stock, then here is a simple tool named SamFirm that can download the latest full stock firmware TAR files onto your PC. Plus you get to check the latest firmware for your device as well. All you need to do is fill in the firmware details into the script and check for the file. Moreover, getting a full firmware file is not a bit difficult job and sometimes may get frustrating. There are some portals claiming to provide these files but they either need a premium package or have speed or bandwidth restriction. But no more. 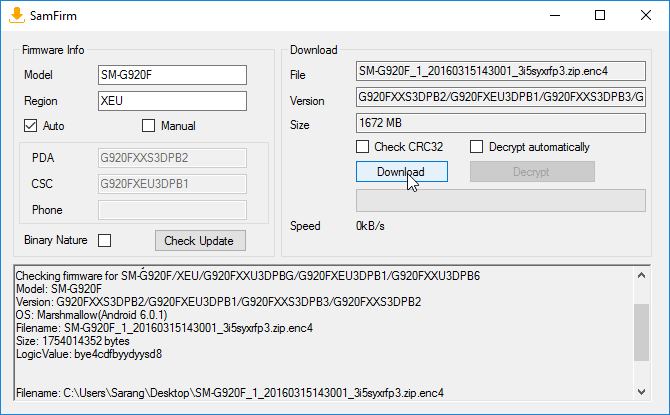 The developer of SamFirm claims that with this software, you can download the firmware files directly from Samsung servers with no such speed restrictions. Now, this script does not guarantee all the firmware files for all regions. It may sometimes fail for some regions or you may need to enter additional information about your Galaxy device into the software. So it’s better to keep the device/software information handy. 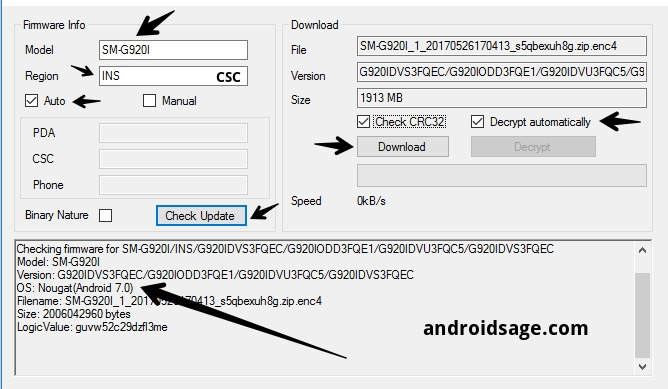 By using the Manual method in the SamFirm script, you can enter the specific firmware details like PDA, CSC and Phone in order to get the accurate firmware for your Samsung Galaxy device. However, the Auto function works fine. I have personally tried downloading many files using this script and it has not disappointed me at all. Follow the tutorial below to know how to download it. The only downfall is that the software is designed for Windows PC only. Step 2 : Download and install SamFirm_v0.3.6 or v0.3.5.zip [Direct Mirror Link] and extract it to a folder. Step 3 : Note down all the details of your Samsung Galaxy device. You can use Phone Info Android app. If you are unable to boot into the system or are unable to retrieve software information, then take a look at the image below and search for all the information you can get for your device like Model, Region etc. from here or comment down below. Note: Find the Region, CSC code, Product code from here. Here is the image for reference of what is CSC code. Step 4 : Go to the extracted folder of software and Run SamFirm.exe. Now fill in the information and check Auto. Now check on Check Update and you will get all the firmware information in the log. You may sometimes need to fill the PSD and CSC of latest firmware in case it can’t automatically retrieve information. Note: Tick the Decrypt automatically option to get the decrypted firmware. Step 5: Verify the information and firmware file and once you are convinced, hit the download button. That’s it wait for the firmware to download. You may sometimes not see the speed and % of download information. You may verify if SamFirm is using bandwidth in Task Manager. Follow and share us on social media. You may also verify if the latest version of the software is available from the source. See how to install this firmware using Odin. Please do provide a back link in source. The .enc4 file is an encrypted file. You can easily decrypt it by clicking the Decrypt option an running the program again. Take care that you use the same file location so it won’t download the firmware again. I will update the article with the decrypt option. keep getting could not fetch. what do I put in for region? On auto I tried US and USA and USA/US no change. I tried manual but the program on the phone ONLY gives me PDA and CSC there is nothing called “phone” and it says I must fill in all 3. Ahhhh ok i am spr official ota is up but n/a for me being rooted. Thankyou. Will try again tomorrow. Err what region for global/international? Which code is the “Phone” code and how do I get it for the S5 Active AT&T? Thanks for this tool. I was so disappointed for all these download sites where I have to pay 15€ for just one download or wait a whole day! Thank you very much!! I thought I was going to buy a new phone. No firmware out there worked for me. All website asked for money. My phone is atleast switching on right now. Hope it works fine for a long time! Touch wood! Hi, Jure. Thanks for commenting. You can go to Settings > Cloud and Accounts > Accounts > Select the Google account you want to remove > Tap on remove Account. That’s it. You can also directly search for Accounts in Settings. I just got a SM-G965U AT&T Used samfirm auto and got this Could not fetch info for SM-G965U/ATT. My issue is I am on t Mobile and want to get wifi calling and pretty much make this a T Mobile branded phone is there anyway to do this? Can I use this tool to make CSC or active CSC changes to my G965F device? I want to be able to use a VOLTE firmware with the T-mobile CSC. My G965F device is actively stuck in XSG CSC while I’m in the USA on the T mobile network.